It was 1998; Miguel Hernandez, DO, (COM ‘08), was 21 years old, a vibrant young man, contemplating his professional path. While preparing to take the LSAT, life abruptly and unexpectedly created a plot twist that would profoundly alter his course. Stunned, Hernandez’s fuzzy, careening thoughts took shape. During his month on life support, Hernandez had heard, hazily, snippets of conversation between members of the medical staff, including some terrifying comments about his prognosis. “It sounds crazy, but I started thinking I had been drugged and my organs were being harvested,” he said. Hernandez’s parents allayed their son’s fears, telling him that doctors diagnosed him with a severe case of necrotizing pancreatitis induced by gallstones. 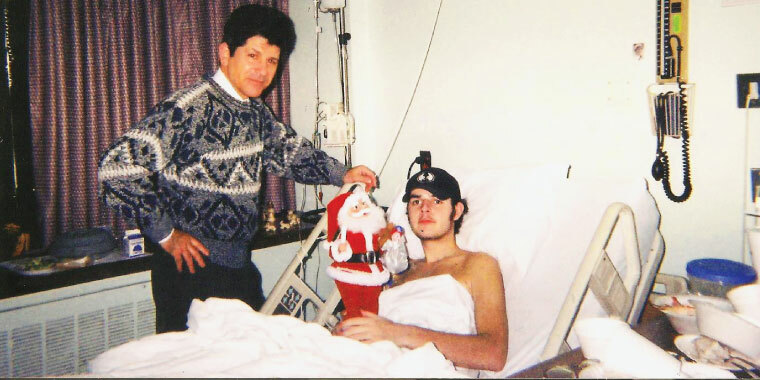 Being young and invincible, Hernandez had ignored symptoms that plagued him days prior to the ER visit: abdominal discomfort with pain radiating to the back. Facing insurmountable odds—because of his complications with necrotizing pancreatitis, Hernandez was given less than a 10 percent chance to live—and, with the help of a passionately engaged family agonizing at his bedside and attentive medical care, Hernandez survived. He emerged on the other side of his six-month hospital stay—three in Albuquerque, three in San Antonio, where his family lived—with a dramatically different perspective on life. And a thirst to thrive. Hernandez believes that at some point in their life, every physician should be vulnerable and understand what it’s like to be on the patient side of the bed. Four months after being admitted to the hospital, Hernandez struck an emotional bottom. A steady stream of physicians, fellows and residents was in and out of his room. His spirit was wavering. Then, one day, the hospital’s chief interventional radiologist—who Hernandez witnessed quizzing fellows and residents on what measures they were taking to make him better—paused during rounds. Looking with admiration at the doctor dressed in the crisp white coat, Hernandez had an epiphany. It wasn’t law school he wanted to pursue—it was medical school. “That moment proves another point—it’s impossible to know how, when or where you’ll impact a person’s life,” Hernandez said. Adversity and diligence, Hernandez discovered, are sometimes necessary ingredients for success and played a role in his admittance to Kansas City University of Medicine and Biosciences (KCU). 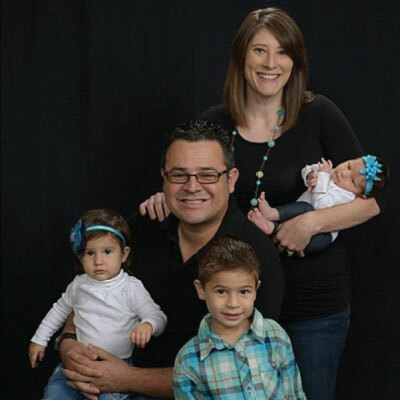 Now 41 years old, Hernandez is medical director for nursing homes in the Dallas-Fort Worth area and married to Kristina—a KCU graduate (COM ’08) who works in hospice care. He recalls being convinced at times during his extended hospitalization that he was on borrowed time and being unsure of the future, if it existed at all. 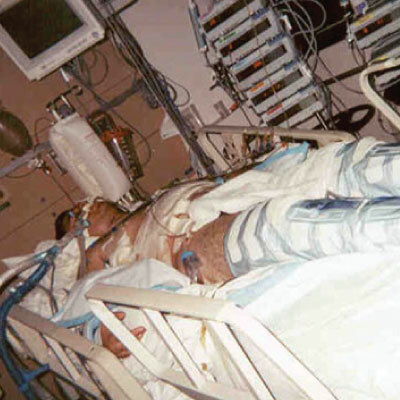 Hernandez’s harrowing personal story—one that he shares regularly with medical students in crowded lecture halls, including KCU, and even colleagues and other physicians—isn’t to elicit sympathy or accolades for his perseverance through a difficult situation. Formerly a hospitalist at a busy university hospital with a rigorous schedule, Hernandez rarely saw his family and knew he needed to change direction. Kristina acknowledges that her husband’s unique outlook on life, as a result of his earlier medical struggle, has equipped him to care for a patient population that is sometimes forgotten. Hernandez credits KCU with giving him the opportunity to succeed. Hernandez—a young medical student, only a couple of months into his KCU journey— met James Pike, DO, (COM ’84), at a homecoming lunch in 2004. They clicked, but it was a random act of kindness later in the day that cemented their relationship. Dr. Pike kept tabs on Hernandez throughout medical school, offering advice, support and encouragement. Hernandez asked Dr. Pike to hood him during his 2008 graduation ceremony and today, the two physicians remain in regular contact, sharing meaningful conversations about their profession, concerns, victories, struggles and hopes. Following in his mentor’s footsteps, Hernandez takes medical students under his wing. For Hernandez, the journey to this point in his life has been anything but predictable—and for that he is grateful.